The description for this tea is accurate, hence the excellent rating. The taste profile is very light and the fragrance is pleasant. I read this tea is good paired with food probably because the taste is so light. 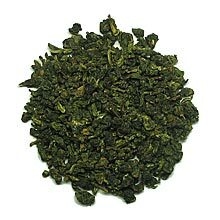 I, however, find this tea too light for my tastes, and I prefer Tie Guan Yin or another strong green oolong. Do order this tea if you want fragrance, but a light taste. both light and lacking in complexity or other interesting qualities. Nothing special really. it’s ok.
Fun, floral aroma that is quite captivating. It is rather light in the cup, so some may say it lacks balance that way, it is all aroma. But I find it strikes a very good balance in aroma and price. Why should the ladies have all the fun with this tea? This is a great tea for a quiet moment by yourself with no outside distractions so you can fully appreciate and enjoy the remarkable sweet floral fragrance. It is very calming. The cup is very light and while the flavor does not match up to the aroma, I would expect that for this type of tea at this price point. I use 6 grams of tea in a 5.5oz pot, but if you wanted a more robustly flavored tea, you could certainly go higher. Strong wonderful aroma, but taste unbalanced with aroma - aroma much stronger.